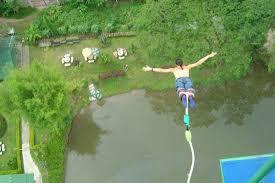 Until now, bungee jumping, has somehow evaded my fairly lengthy adventurer resume. Using a pulley system, we ascend two hundred feet into the air in a man made platform. I fully expected myself to be laughing at the top. I’m an experienced skydiver, regularly parting ways with airplanes at 13,000 feet. This was going to be easy. This was gonna be a breeze. “One, two, three, GO!” yelled the jump master. But I hung onto the railing, the unfamiliar feeling of fear aching in my body. “One million percent,” he replied. Let it loose! I jumped up as high I could and felt the exhilarating feeling of acceleration pull me downward. I have to say, I LIVE for that feeling! The aliveness, nothing else is present, except for the RAPIDLY approaching earth. “Aaahhhhhh!” I let a scream, but it was pleasure. This feeling is what I live for! I felt pumped for hours afterwards, I’m definitely doing it again. I suppose that is why I went jet skiing after I got back to my hotel. Going fifty miles per hour on the open water, jumping waves, the spray in your face is absolutely exhilarating. This is living! My stay in Pattaya lasted three days. Not that it’s not a nice vacation, relative to say, Lincoln Nebraska, but of the places I have been to in Thailand, it’s the place I would be least likely to return to. Sure, you can jet-ski, parasail (which I also did, believing as I was flying through the air I was Peter Pan) but on the whole, I’d recommend skipping Pattaya. Strange....you say skip Pattaya but your give no reason why.